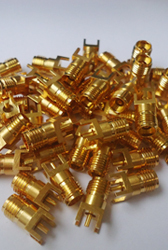 Connov products included many kinks of connector, like 1.85mm, APC-7, 3.5mm, 2.92mm, 2.4mm, N and SMA connector, and also provide frequency DC from 18GHz to 65GHz adapters. These product all have reliable performance are applie in instrumentatio, military, rado astronomy and satcon. Interface dimensions minimize distortion and deterioration of the mating surfaces. Fixed bead-contact assembly prevents transmission of mating torques to circuit elements. Mating sequence touches outer contacts before center contacts, eliminating female center contact damage during mating. Plug coupling nut extends beyond the male center contact, protecting the contact while not mated.